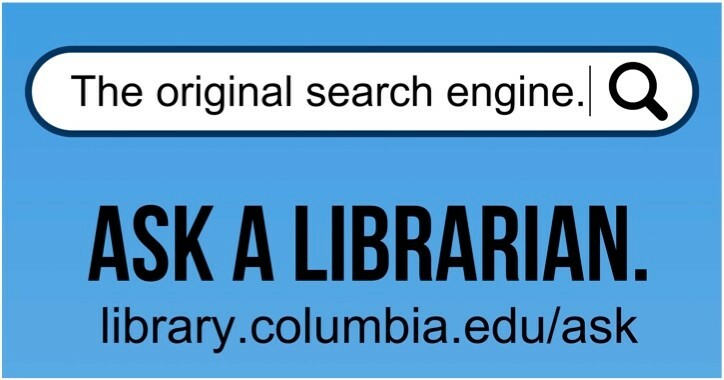 Go to CLIO (Columbia Library Information Online) to see if it is available in one of the Columbia libraries. If a book is not at Columbia or the Columbia copy is checked out, try Borrow Direct. If the Borrow Direct libraries do not have an available copy, try ILL to request a copy. Note: Columbia is a member of GIF (Global ILL Framework), which allows us to borrow books and get copies of articles from GIF member libraries in Japan. CLIO : library web : Columbia University Libraries online catalog. Contains catalog records for books, serials, newspapers, music scores, sound recordings, microforms, maps, computer files, archives and manuscripts, videorecordings, and other visual materials added to the Columbia University Libraries since 1981, including some material acquired before that date. Also contains records for the U.S. Government Documents collection in Lehman Library. Columbia's online public catalog was transformed to a discover tool and contains records for almost all materials, including books, periodicals, microforms, and databases, and beyond. Most of Japanese language materials are cataloged both in Japanese language as well as translitelation of Japanese in romanization in the modified Hepburn System employed by the Library of Congress. It is more effective to search by romanization rather than Japanese, but pay attention to word divisions. CLIO search tips, please click here. Contains over 48 million records, covering all materials cataloged by OCLC member libraries around the world. A new version of Webcat -- a service for searching for information on books and journals held in libraries of universities and research institutions in Japan. Searchable for about 10 million titles held in 1200 university libraries (totaled over 100 million books), and about 1.5 million authors of these books that has been accumulated through the online cataloging system (NACSIS-CAT) which NII provides. This database uses an “associative search function” that uses keywords to extract other words from the bibliographic records from the Edo period to the present that have a high association with them. Search materials　(books, journal articles, "Standards & Technical Reports, Materials on the Allied Occupation of Japan), held by the National Diet Library. “NDL Search” is a new search service of NDL from 2012 for multi-types of materials, not only books and journal articles but also digital materials, from in public libraries, archives, museums, institutes of academic research and NDL in Japan. Please note: Columbia does not participate in ILL for books with NDL. NDL will, however, provide photocopied articles to Columbia. WINE is the Waseda University Library online catalog. Although it contains 2.9 million records, WINE does not reflect the library's complete holdings. This catalog is useful for finding Japanese name readings. Collection of digitized Japanese academic or scholarly books selected from MEL (Maruzen e-Books Library). The NDL Digital Collections enables a user to search and view a variety of resources including books, collected and stored by the National Diet Library of Japan. A collection of non-copyright-protected Japanese literary works, available for download in several file formats. This website contains full-text versions of several works of classical Japanese literature, including the Manyoshu, Genji Monogatari, etc. JAIRO is the cross-sectionally search service for academic information (journal articles, theses or dissertations, departmental bulletin papers, research papers, etc.) which has been accumulated in Japanese institutional repositories. Zenshū, sōsho sōmokuroku (全集・叢書　総目録）. With "Pre-modern Books in Japanese" as the keyword, the "Project to Build an International Collaborative Research Network for Pre-modern Japanese Texts (NIJL_NW project)" was inaugurated at the National Institute of Japanese Literature in 2014. In carrying out this project, we will construct a "Pre-Modern Japanese Book DAta Base " as a foundation for research. A database of pre-Meiji materials maintained by the National Institute of Japanese Literature (Kokubungaku Kenkyu Shiryōkan). This database, “New KOKUSHO SO MOKUROKU” is a union catalogue of early Japanese books. (It also includes Chinese classics and books of the Meiji period). It provides authoritative information about Japanese classical literary works and their authors. It also provide bibliographic information on early Japanese books, and their holding libraries. The National Diet Library Digital Collections also includes rare books and old materials collected and stored by the NDL of Japan. Kyoto University Rare Materials Digital Archive has been newly released. This archive is also compatible with the International Image Interoperability Framework, IIIF. Edited and individually maintained by Michael Watson, Faculty of International Studies, Meiji Gakuin University, this website contains an exhaustive list of classical Japanese texts, along with related translations (mostly English, some French and German) and studies on the texts. The database is compiled by the Japan Foundation in collaboration with the Japan P.E.N. Club for Japanese literature, mainly works after the World War II, which are translated into other languages. Search can be made in Japanese or its Romanization.